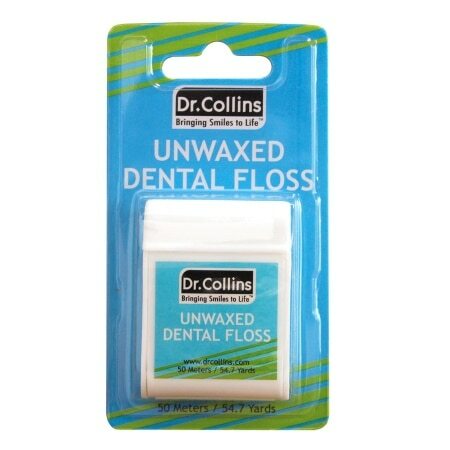 Dr.Collins Unwaxed Dental Work Floss is made of a high quality Nylon that helps to remove decay-causing debris and bacteria from between teeth and below the gumline. The incredibly strong fiber reduces shredding and breaking, providing for a healthier gums and cleaner, fresher breath. A thinner floss for cleaning between even the tightest spaces. Cut off about 18" of floss. Wind some around the index finger of each hand until you have about 2" to work with. Gently slide the floss between your teeth until it reaches the gum line. Then, curving around each tooth with light pressure, allow the floss to fan out and cover as much surface as possible, gently work against the side of each tooth. Note: Slight gum bleeding during flossing is frequently a sign of unhealthy gums. By flossing daily bleeding should stop. Consult your dentist if bleeding persists. Read directions prior to use.